Complete line of pumps - solutions for every industry Rexroth’s complete line of hydraulic pumps serve virtually every industry in manufacturing and technology applications such as railway engineering, chemical process plants, power and environmental engineering, automotive engineering, plastics processing machinery, paper industry, presses, test rigs and simulation systems, marine/offshore engineering, special projects, and civil/water engineering, transportation technology, and machine tools. Pursuing a comprehensive understanding of these application areas and working closely with customers, our engineers have developed unique electrohydraulic innovations in control technology. 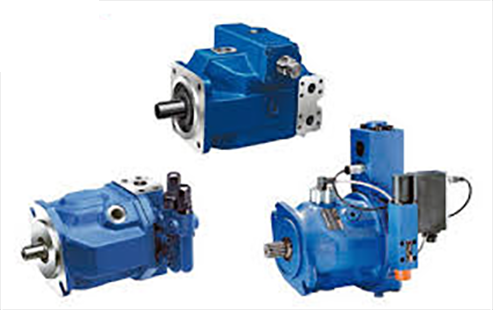 The result is hydraulic pumps with greater precision, dependability, and reliability. Contact Please get directly in contact with our hydraulic motor specialists. Local Contact - Contact locator World leading hydraulic pumps Keeping a market expectations mindset, Bosch Rexroth is setting a new standard for hydraulic pumps with continuous development at the highest standards and quality. Rexroth pumps are designed for high reliability and efficiency. The lineup of pumps includes - Axial Piston Pumps, External Gear Pumps, Internal Gear Pumps, Gerotor Pumps, Vane Pumps, Radial Piston Pumps and Electro-hydraulic Pumps. Rexroth pumps are designed as a solution point of view where the products are compatible with each other in order to provide a whole portfolio for our customers.